Preheat your oven to 450 degrees (convection roast). 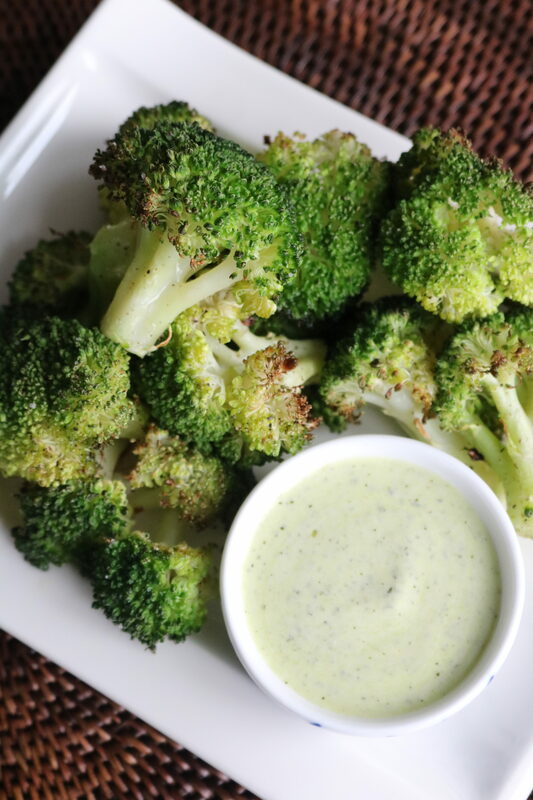 Arrange broccoli in a single layer on a baking sheet and toss in olive oil. Sprinkle with salt and pepper. In a separate bowl whisk together pesto, sour cream, white balsamic, lemon juice, half and half, and salt until well combined. Roast the broccoli for 4-5 minutes. Remove from oven and preheat to broil. Broil for 1-2 minutes until it begins to char. Remove and serve immediately or at room temperature with creamy pesto dipping sauce. Enjoy!